U.S. stocks closed slightly lower Wednesday, after trading in a narrow range for most of the day. Investors found few reasons to place any big bets. Corporate earnings continue to paint a mixed picture of the health of the global economy, and worries about the presidential election, the fiscal cliff and Europe's debt problems are keeping investors on edge. "People are frozen now and not interested in adding to their portfolios until they get a clear signal on what will happen with the fiscal cliff and taxes on their investments," said Todd Morgan, senior managing director at Bel Air Investments. Investors shrugged off the Federal Reserve's latest policy statement, which, as expected, didn't signal any major changes to interest rates or the central bank's plan to stimulate the economy through large bond-buying programs. The Dow Jones Industrial Average, the S&P 500 and the Nasdaq closed down between 0.2% and 0.3%. All three indexes are up between 7% and 15% so far this year. Wednesday's action (or lack thereof) is typical of the markets lately. After having their worst day since June last Friday, stocks opened the week barely changed, before another sell-off sent the Dow and S&P 500 to their lowest levels in seven weeks. "For so much of this year, there's been a divergence between the stock market and the economy. The economy hasn't been great but the stock market moves higher," said Sam Ginzburg, head of trading at First NY. "The stock market and the economy have been converging over the past few days as people are getting jittery." Earnings from Facebook (FB) helped counteract some of the gloom surrounding third quarter corporate results. Investors were relieved that Facebook's earnings came in as expected, with sales up 24%. Shares of the social media company shot up more than 20%, the largest one-day gain since Facebook went public in May. Other social media sites followed suit. LinkedIn (LNKD) and Yelp (YELP) logged big gains. Zynga (ZNGA) closed lower, but its stock moved higher after hours. 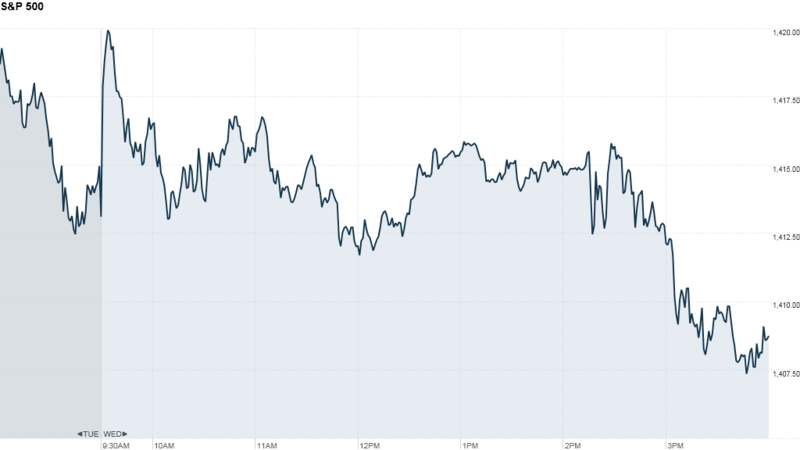 Zynga's third quarter results released after the bell beat analysts' estimates. Boeing (BA) reported earnings that beat analysts' expectations and raised its profit outlook for the year. Despite that, the aircraft manufacturer's stock closed slightly lower. AT&T (T), another blue chip, closed even after activating 1.3 million iPhones during the quarter. Asian markets ended mixed after a report showed China's manufacturing sector hit a three-month high in October. HSBC's initial purchasing manager's index for China jumped to 49.1 in October from 47.9 the previous month, the bank said Wednesday. Any reading below 50 indicates that factory growth is shrinking rather than picking up speed. The Shanghai Composite (SHCOMP)edged up nearly 0.1% and the Hang Seng (HSI) in Hong Kong gained 0.3%, while Japan's Nikkei (N225) slid 0.6%. Meanwhile, news out of Europe was less encouraging. A key survey of purchasing managers in the euro area underscored the grim economic situation in the currency zone when it fell to a 40-month low of 45.8 in October, signaling continued declines in the manufacturing and services sectors. Additionally, a gauge of business sentiment in Germany, the region's economic engine, fell to a two-and-a-half year low. Despite the dour data, European stocks ended the day higher. Britain's FTSE 100 (UKX) and the DAX (DAX) in Germany moved up 0.1% and 0.3%, while France's CAC 40 (CAC40) edged up 0.6%. On the U.S. economic front, new home sales for September beat economists' expectations, offering yet another sign of an improving housing market. The Census Bureau said that new home sales for September came in at an annual rate of 389,000, climbing 5.7% to hit a 2-year high. Companies: Trading in shares of IAC (IACI) was briefly halted and some trades declared erroneous by Nasdaq Wednesday. The media conglomerate confused investors when it altered its forecast for one division. IAC's stock closed down more than 8%. The Manhattan U.S. attorney filed a $1 billion lawsuit against Bank of America Corp (BAC) for what it claims are the bank's fraudulent practices underwriting mortgage through Fannie Mae and Freddie Mac. Bank of America's stock closed down 0.5%. 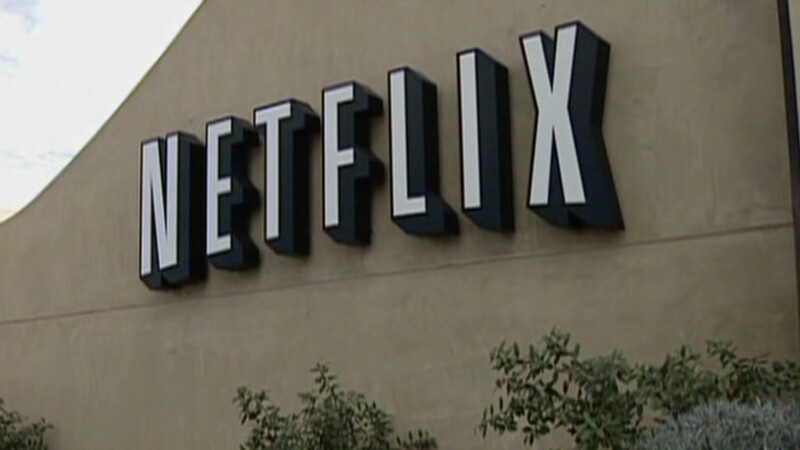 Netflix (NFLX) shares plunged nearly 12%, after the company reported disappointing figures for new streaming subscriptions and offered weak guidance Tuesday after the bell. Currencies and commodities: The dollar rose against the euro, but fell versus the British pound and the Japanese yen. Oil for December delivery lost 94 cents to $85.73 a barrel. Gold futures for December delivery fell $7.80 to $1,701.60 an ounce. Bonds: The price on the benchmark 10-year U.S. Treasury edged lower, pushing the yield up to 1.77% from 1.76% late Tuesday.